LGTNetwork is honored to welcome 21 Club New York to our network. 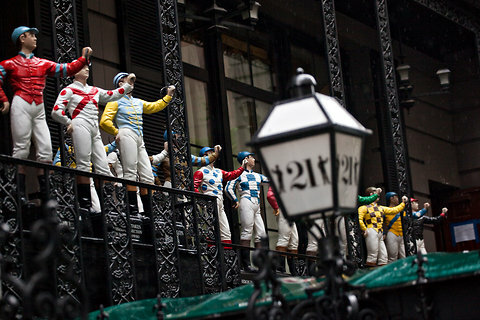 The 21 Club, often simply 21, is an American traditional cuisine restaurant and former prohibition-eraspeakeasy, located at 21 West 52nd Street in New York City. Under the Belmond management, 21 Club, with two restaurants and ten private event rooms, is the perfect spot for cocktails, lunch, dinner, or that next important event. At the Bar Room, follow in the footsteps of movie stars, presidents, captains of industry and sporting legends in one of the world’s most charismatic watering holes. At the heart of ’21’ is the legendary Bar Room. The hangout of choice for America’s rich and famous, it is renowned for its whimsical and colorful collection of ‘toys’ suspended from the ceiling. Each of these was donated by a legion of legendary sports stars, presidents, movie stars and business leaders. Evidence of its Prohibition-era heritage also abounds—even the hidden chute used to dispose of illegal liquor bottles is still in use. The menu features classic and contemporary American cuisine. Jack & Charlie’s Ale, Speakeasy ‘Prohibition Ale’ and a Grand Award-winning wine list complement any meal. At 21 Bar & Lounge, time-honored tipples, world-class wines, classic cuisine and surroundings steeped in history. From appetizing bar bites and artisanal beers, to signature cocktails and a Grand Award-winning wine list, Bar ’21’ & Lounge is the perfect place for a light lunch or a pre-theatre cocktail. Enjoy a drink at the bar and rub shoulders with New York’s famous faces or secure a seat in the comfy, cozy lounge. At Upstairs at 21, enjoy culinary perfection in their elegant mural-lined dining room. Located one flight up from the world-famous Bar Room, Upstairs at ‘21’ is a sophisticated 32-seat restaurant famed for its intimacy and elegance. Their chef’s culinary creativity delivers an array of mouth-watering dishes reflecting the past and present ’21’ in a sumptuous four course tasting. As you enjoy your meal you can marvel at the murals of four New York landmarks. Each one was specially created for Upstairs at ’21’ by Brooklyn-based artist Wynne Evans. The Upstairs at ’21’ is also available for private events.